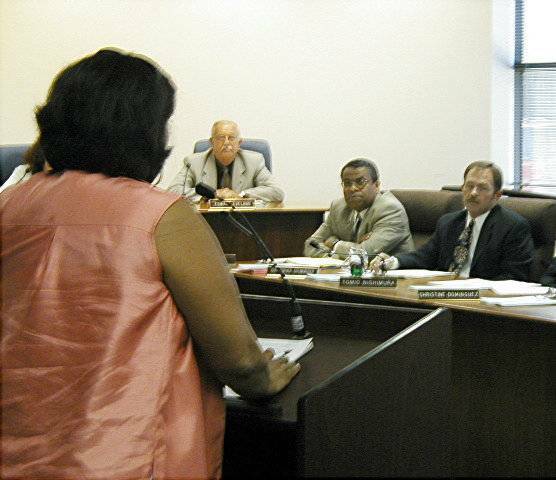 (June 19, 2002) -- As exiting LBUSD Superintendent Carl Cohn and successor Chris Steinhauser watched in stoney silence, a LB taxpayer publicly sought answers to no avail from LB School Boardmembers moments before they voted to hire Steinhauser for a four year term with an annual salary of $198,000. LB's School Board previously voted to pay incumbent Cohn $230,000 a year, a sum that will be used to calculate his future pension. Cohn is now leaving to teach at U.S.C. 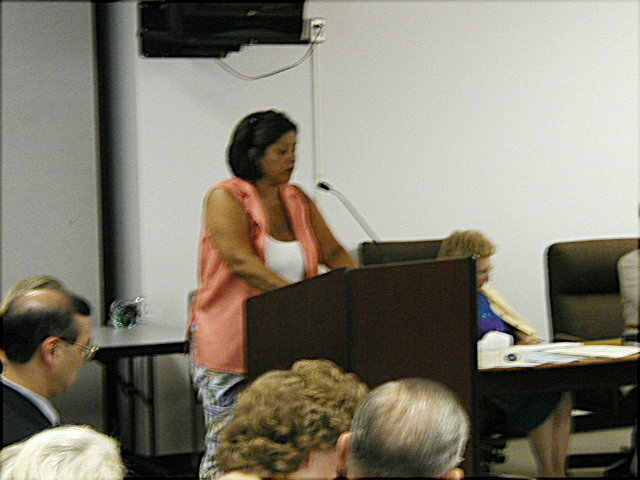 Before the Board vote, Ms. Reyna Akers, a member of the public, came to the podium to speak. In polite, measured tones, Ms. Akers requested the records and data on which Steinhauser's $198,000 salary was based. She asked, "[W]ouldn't it be prudent to ensure that the district had some leverage such as an annual renewal/review clause for such an important leadership position as superintendent?" "Your actions are particularly suspicious since the public was excluded from the selection process and this board is opposed to the public scrutiny of televising meetings," she said. Ms. Akers added, "It would be fiscally irresponsible of this board to award a four-year contract to a superintendent without any accountability for improved student achievement." There were several seconds of silence after Ms. Akers spoke. Not one School Boardmember offered a substantive response to her points. We all know our district saved significant amounts of money by avoiding a lengthy and costly recruitment for our new superintendent, when all we had to do was look in our own back yard. Pursuant to the Freedom of Information Act, I respectfully request any and all records of data on how it was determined that the salary would be $198,000 for the new superintendent and for the criteria used to make this selection. Would this Board have paid another candidate with a Ph.D. and experience as a superintendent the same salary? Given the state�s education budget cutbacks, wouldn�t it be prudent to ensure that the district had some leverage such as an annual renewal/review clause for such an important leadership position as superintendent? Upon whose recommendation was it determined that our children's money should be spent to purchase a term life insurance policy for one million dollars? These questions have no bearing on how I personally feel about the new superintendent for whom I have great respect. Rather, my concern lies with the methodology of this Board. It is not that I object to the board�s selection of superintendent, rather I question what the Board�s methodology was regarding this decisionmaking process. Your actions are particularly suspicious since the public was excluded from the selection process and this Board is opposed to the public scrutiny of televising meetings. The new superintendent will be a welcome change to this district, especially if his main vision is improving academic achievement and equal educational opportunity at all schools for all students, including special education. It would be fiscally irresponsible of this Board to award a four-year contract to a superintendent without any accountability for improved student achievement. I respectfully request a response. After several seconds of silence, School Board president Bobbie Smith thanked Ms. Akers for her testimony...but no Boardmember offered a substantive response.